It has been a while since I made my last post. It's been super busy during the summer and now I just came across a perfect item to post. Yes, it's my GYOZA. 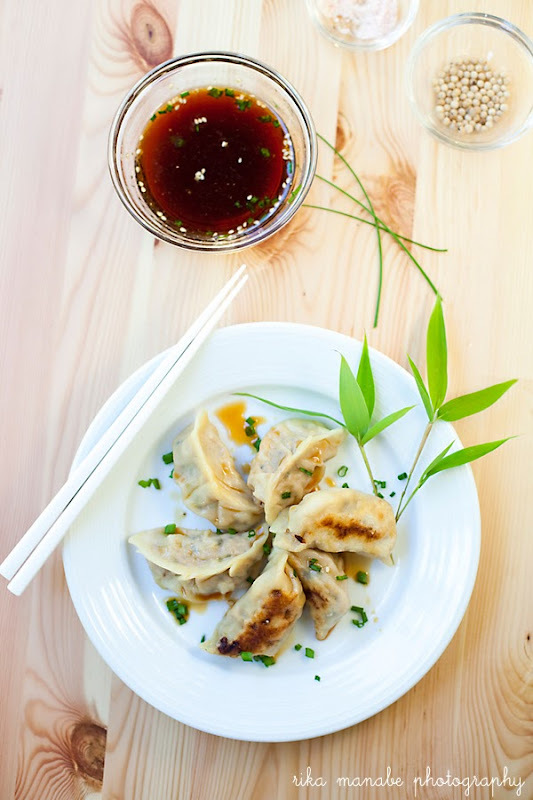 Gyoza is probably one of my favorite foods to eat and make. 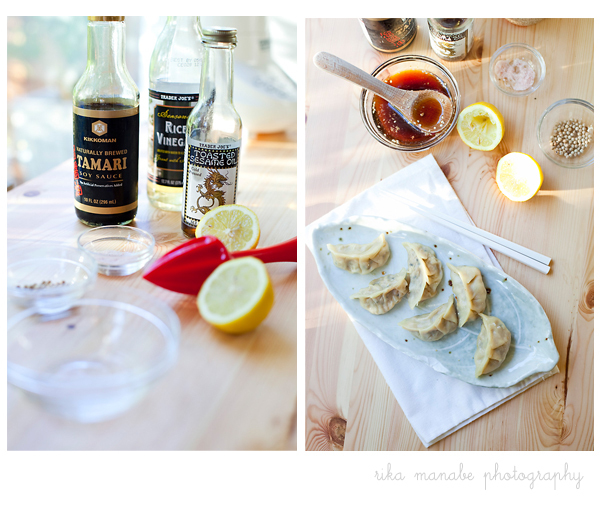 When I think about making gyoza, it almost always makes sense to just do it. They can be made with a variety of veggies and meats, are rather quick and easy to make, the kids love them, hubby loves them, everyone else including people who are not familiar with Asian food seem to love them. Every time I see my mom, she asks me to make them. If you are not sure what to bring to a potluck party, this is a very good option. This time, I decided to make the wrapping skins myself rather than buying pre-made ones. It only takes some flour, salt and water. My son loves rolling dough, so it's always a good thing when I need to keep him happy while I'm cooking. I used ground turkey and cabbage this time for the stuffing inside since I had them in my fridge already. It turned out really well. My favorite combination is still ground pork and Japanese nira chives. Making gyoza is also somehow therapeutic to me. Something to do with repeating the wrapping process, my mind is lost in a calm and quite place where all I care about is to wrap each one of them perfectly, which I never succeed in doing. 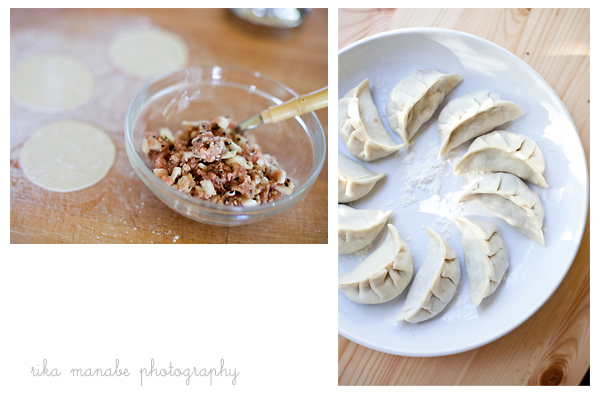 Speaking of wrapping gyoza, I've had a couple of opportunities to make and eat Chinese gyoza with Chinese women. The way they made their gyoza was truly amazing. They can wrap 10 of them in A MINUTE. I was blown away by how fast they made them and how perfect each one looked. By the way, they often steam gyoza in China and fry the left-overs while gyoza is typically pan fried almost always in Japan. Lastly, good gyoza must come with good dipping sauce. I like to mix and make my own. This time, I used tamari soy sauce, lemon juice, rice vinegar, sugar and sesame oil. Spicy sauce or oil is also a good one to add, but my family doesn't like it too spicy. I made about 30 of them and they were gone in 10 minutes. I really should make them more often. I can add and hide any veggies in them, the kids love them, AND the kids can't make too much mess with this fabulous finger food. I'll be off to Prague with the family for almost a month! Can't wait to be in a foreign place and be lost for a while. I'm so excited that I act the opposite. Gyoza skin: mix flour, salt and water. Kneed the dough for at least 20 minutes to make it nice and smooth. Flatten the dough with rolling pen or pasta machine until it's paper thin. Flour the dough well. Use 2-3" cookie cutter or round cutter to create about 30 skins. 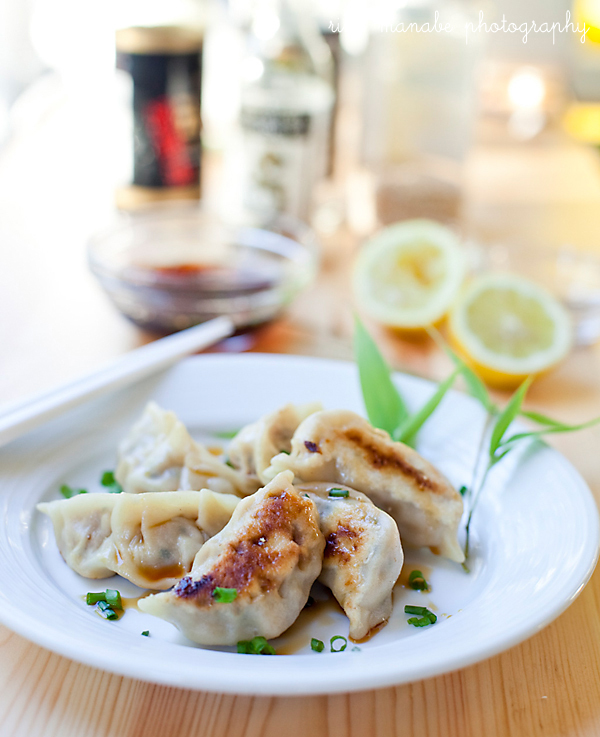 Gyoza stuffing: finely chop cabbage, garlic, ginger and mix them with ground turkey. Add other ingredients and mix it well. Take a round skin, wet the top around the edge with water. Put a small amount of stuffing in the middle and fold the skin in half. Use thumbs to pleat and seal the skin. Make sure it's sealed completely, otherwise the inside won't be juicy after it's cooked. Add 2 tbs of oil in a pan and heat it at medium to medium high heat and fry gyoza for 3 minutes until the skin is nicely crisp. Add 1/4 cup of water and put the lid on to steam for a minute or so. Thanks, Trevor, I'll make these for you anytime!